Operating Systems may be roughly divided into two categories: desktop and realtime. A traditional desktop operating system (OS) (e.g. Windows, Linux, MacOS) is designed to interact with users, input/output devices such as printers, video displays and mice. In contrast, a Real Time Operating System (RTOS) is designed to interact with machinery where critical timing is paramount. 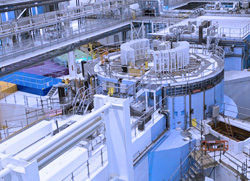 The choice of operating system is especially important in measurement applications, robotics and automation systems controls where distances of microns can mean the difference between “go” and “no-go.” In modern computer-controlled manufacturing a program delay could lead to errors, significant safety hazards and the cost of production downtime. It is important to note that Real-Time is not the same as “high performance.” In other words, merely adding a faster CPU or more memory is no substitute for precision reliability. We’ve all experienced a ‘hiccup’ on our personal computers where the mouse freezes on the screen for an instant because the computer was busy doing something else – waiting on data from the hard drive, checking your email, indexing the files on the hard drive, etc. Merely adding a faster CPU cannot cure this problem, as the OS yielded control to a badly-behaved application. With a RTOS, the operating system takes control from each program at a known, controlled interval and gives it to the next, ensuring smooth transitions. What good is a precision tool, if all the components in a production chain are not able to meet those same accuracy standards? A rhetorical question, but it should be clear that an Operating System designed to play video games, read email and surf the internet is not an ideal choice for running a telecommunications satellite, five-axis robot arm, anti-lock braking system, or kidney dialysis machinery where a delay of even a millisecond could result in system failure, property damage or loss of life. The operating system controlling your equipment must be able to constantly monitor all inputs and detect error conditions, providing input and checking for problems tens or even hundreds-of-thousands of times per second, regardless of what is happening elsewhere in the system. This is possible only if the OS can guarantee a maximum duration and interval for each operation that it performs. This is known as deterministic, or “hard” real-time. Operating systems which only deliver a minimum interval are known as “soft” realtime. A non-realtime OS cannot guarantee a response time, so even if it usually performs within specifications, we must concern ourselves with a worst-case scenario — a delay while moving an arm, or closing a valve could cause an error. A RTOS can guarantee that a program will run with an elevated degree of control over how tasks are prioritized and ensure that important deadlines are met. Our design allows real-time and non-real-time applications to run simultaneously, yet independently on the same computer/digital controller with unparalleled reliability. Even a Windows OS crash, blue-screen or reboot will affect only the user interface – critical safety systems, data collection, and motion control software will continue to run, unaffected. What makes Autonetics software your first choice in a real time operating system? Thoughtful design, tremendous scalability and exceptional integration tailored directly for your equipment and production goals.